I’ve just applied an oil-modified seal/finish to my bare wood gymnasium. Can I apply Sport Kote on top of the oil-modified product? Yes, but first wait for the oil-based product to cure. Generally, 48 hours after the last coat of oil-based product has been applied is the necessary waiting period before applying Sport Kote. I see that OMU Wood Seal works under Sport Kote. Can I use a water-based sealer under Sport Kote? Yes, we recommend using our product called Sport Seal. 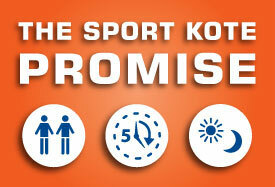 What game line paints work best with Sport Kote? Paint manufacturers are constantly changing formulas. That said, we can only recommend using high quality 100% acrylic latex enamels. You should always test the paint with Sport Kote for adhesion in an inconspicuous area first. What is Essential’s position on applying tape to gym floors? This is a common practice in many facilities. Short-term application of tape can work nicely to provide temporary game lines (24 hours or less). Tape left on the floor for longer periods of time is likely to pull finish off the floor when removed. The reason for this is that the adhesives in the tape eventually form a bond to the wood floor finish. From time to time I hear complaints about slipperiness on my gym floor. What is the cause of this? Let’s answer your question by saying that all Essential Industries’ wood floor finishes are UL-Classified as to slip resistance. Slick floors are caused by a couple of things. Look for overuse of mop treatments. Lack of cleanliness is a big contributor. Water and sweat left unattended can also cause slickness. Also, on newly refinished floors, lack of dry time and/or lack of proper ventilation can lead to slickness due to solvent rain-back. What should I do if my floor is slippery? Using Sport Clean, scrub your floor using an auto-scrubber equipped with red pads. Then, dust mop at least twice a day. To eliminate problems down the road, wet scrub your floor once a week and periodically burnish (when using Sport Kote). I am not sure how to handle ventilation when refinishing. What are the best procedures to follow? For best results, we recommend turning air conditioning/ventilation OFF just before recoating to keep finish from flash drying. AFTER you’ve completed the recoat process and the finish has “skinned over”, increase ventilation to maximum levels to assist in the drying and curing process. I’ve got a big basketball tournament next week in my gym. I don’t have the time or money to recoat the floor. Is there anything I can do to bring Sport Kote back to “like new”? Yes. Sport Kote is easily restored with Sport Prep diluted eight ounces per gallon (1:16) in an auto-scrubber equipped with blue pads. Rinse the floor after scrubbing and burnish with a propane buffer equipped with a hogs hair pad. What are the main causes of flaking or peeling finish from a wood floor? Flaking is most often associated with wax contamination and/or poor cleaning prior to recoating. Peeling is usually caused by incompatible products (some pre-finished engineered floors, for example), improperly dried seal or paint or improper cleaning/abrasion before recoating. How do I figure the film thickness of a coating? Film thickness is expressed in mils – one mil is equal to one thousandth of an inch. One gallon of 100% solids material covers 1600 square feet at one mil thickness (about the thickness of a sheet of copy paper). To figure the coverage of Sport Kote to achieve one mil thickness, you would take 1600 ft2 X 0.29 (29% solids) = 465 square feet. Since Sport Kote is used at 800 to 1000 square feet per gallon, users are typically getting 0.6 mil (465/800) to 0.5 mil (465/1000) coverage per coat. Keeping a floor well finished and maintained is the best defense against costly floor replacement or sanding. If my floor does need replacement or sanding, what would the average cost be? 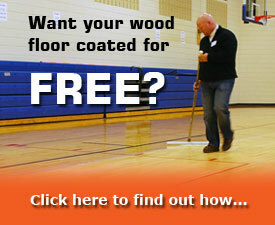 For 10,000 square feet of maple flooring, expect to pay approximately $9.00/square foot for installation of a new floor. This includes game lines, sealer and finish. For sanding to bare wood and refinishing, expect to pay $1.25/square foot. This includes games lines, one coat of seal and two coats of finish. Is there a specific process I should follow for finishing portable wood floors? Most definitely. If you just finish the floor as you would a normal wood floor, the boards will likely glue themselves together, making it impossible to take the floor apart down the road and likely resulting in expensive repairs or full replacement. The key is to finish the floor together (or in large sections if the floor is gymnasium size) and once the finish has been applied, immediately pull the floor apart and wipe all edges clean of finish. Let the floor dry apart, and then put it back together a few days later. This procedure requires good manpower since there is a lot of wiping that needs to be done but it is the only way these floors can be successfully recoated. Can Sport Kote be applied to wood floors that have radiant heat below them? Yes. There are just two things to make sure you do before application. First, turn off the heating system a few hours beforehand. Then, after the last coat of finish is applied, wait another 36 hours before turning the heat back on.